A view of the border fence outside the Kitton outpost on the border with Afghanistan in North Waziristan, Pakistan, Oct. 18, 2017. Pakistan's unilateral installation of a robust fence on its largely porous border with landlocked Afghanistan this week sparked fresh military clashes between the uneasy neighbors, and provoked Islamabad to close a busy southwestern crossing point. The abrupt closure of the Chaman crossing stranded travelers and hundreds of trucks loaded with commercial goods on both sides. Pakistani authorities Monday allowed hundreds of stranded people to walk across the border, but they did not permit trade convoys to resume their journey in either direction. The skirmishes broke out Sunday afternoon near the border town of Chaman when Afghan security forces opened fire at a team of military workers erecting the fence, insisted Pakistani army officials. The fighting lasted for about eight hours, according to Afghan officials. Pakistan military's chief spokesman, Major-General Asif Ghafoor, told VOA the Chaman crossing largely remained closed, saying the "provocative" act by Afghan security forces was to be blamed for the conflict. "But no casualties [occurred] on our [Pakistani] side," Ghafoor said, while responding to Afghan allegations that the clashes killed three Pakistani border forces and injured five others. FILE - Pakistani soldiers stand guard at newly erected fence between Pakistan and Afghanistan at Angore Adda, Pakistan, Oct. 18, 2017. Islamabad maintains the fencing program will help prevent terrorist infiltration in either direction across the nearly 2,600-kilometer (1,600 miles) rugged border. Afghanistan opposes the Pakistani border security plan because Kabul historically disputes the 1893 demarcation drawn during the British colonial era. Afghan officials also insist any permanent structures on what they call the Durand Line will add to challenges facing divided families stranded on both sides of the frontier. Kabul's ambassador to Islamabad, Omar Zakhilwal, reiterated those objections while speaking to Pakistani media this week. "We do oppose the barbed wire. That is against the closeness of the population on both sides and the interdependency that exists [between them]," he said. Pakistan strongly rejected Afghan objections and maintained it inherited the international border after gaining independence from Britain in 1947. "It is not fencing against the people or the nation of Afghanistan, but it is aimed at stopping the flow of terrorists. We are spending 76 billion rupees [$600 million] of this poor [Pakistan] nation on the border fencing," said army spokesman Gen. Ghafoor. Pakistan initiated the border security project in 2017. 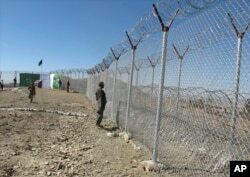 Ghafoor recently told VOA the construction of the fence and new forts along most of the Afghan border is expected to be completed by the end of 2019.